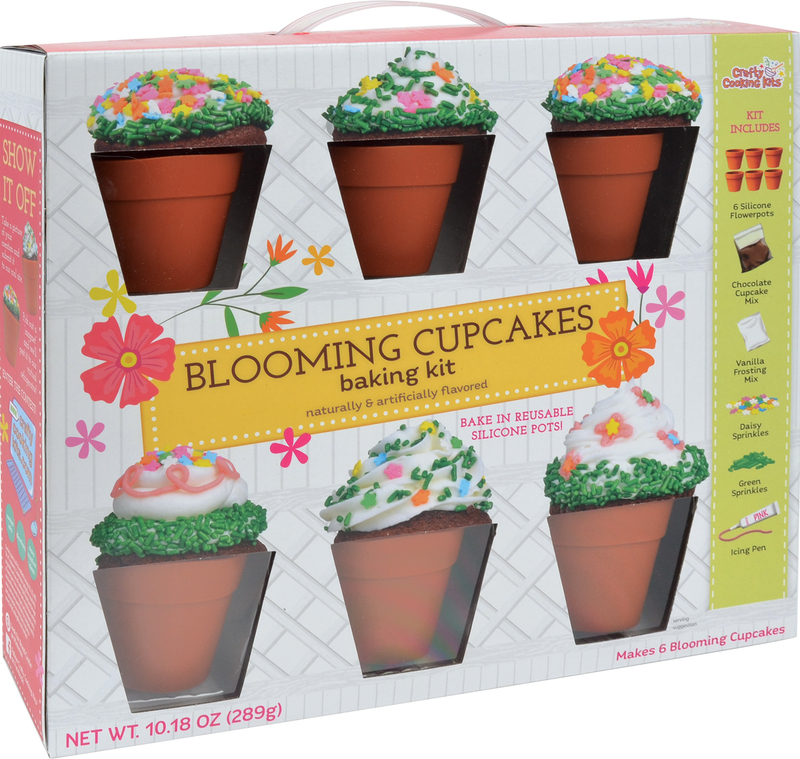 Bring the garden to the kitchen this season with Blooming Cupcakes! 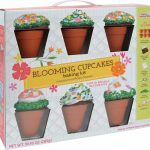 Silicone flowerpots are included and will help you to bake the perfect cupcakes. Cake Mix: Sugar, Enriched Cake Flour (Wheat Flour, Niacin, Reduced Iron, Thiamine Mononitrate, Riboflavin, Folic Acid), Cocoa (Processed with Alkali), Shortening (Palm Oil, Mono And Diglycerides, Polysorbate 60), Skim Milk Solids, Natural And Artificial Flavors, Baking Soda, Salt, Baking Powder (Sodium Acid Pyrophosphate, Sodium Bicarbonate, Corn Starch, Monocalcium Phosphate). 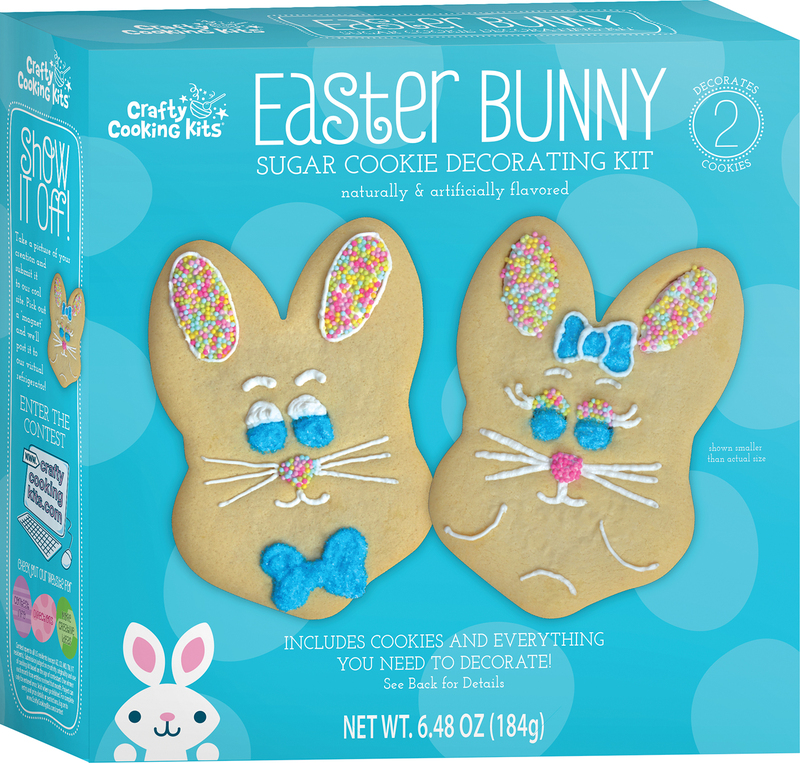 Daisy Sprinkles: Sugar, Corn Starch, Partially Hydrogenated Vegetable Oil (Cottonseed and/or Soybean), Soy Lecithin, Yellow 5 Lake, Dextrin, Blue 1 Lake, Confectioner’s Glaze, Natural and Artificial Flavor, Carnauba Wax. Icing Pen: Sugar, Rice Flour, Partially Hydrogenated Vegetable Oil (Cottonseed and/or Soybean), Corn Starch, Cellulose Gum, Carrageenan, Soy Lecithin, Titanium Dioxide Color, Yellow 5, Yellow 6, Red 3, Artificial Flavor, Blue 1. 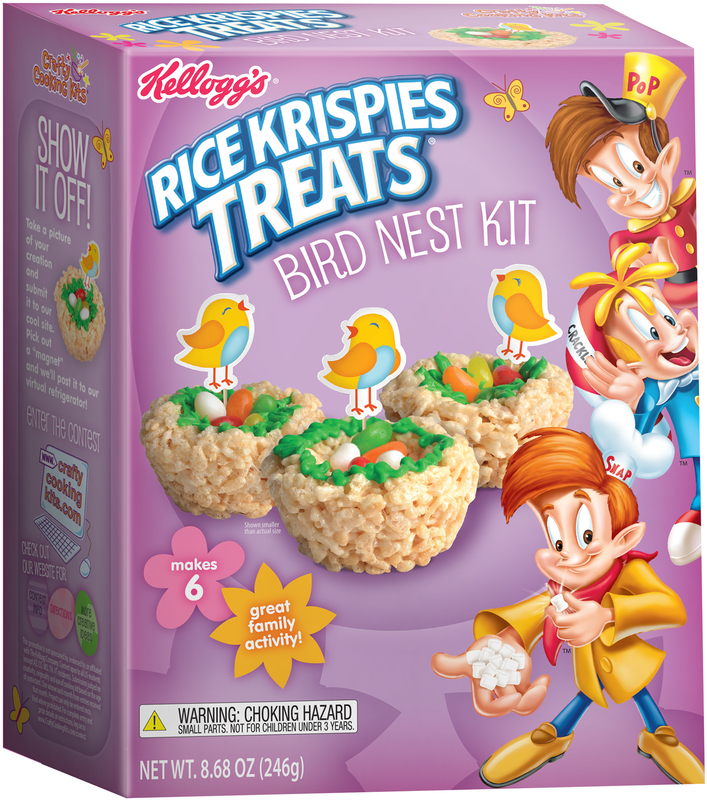 Frosting Mix: Sugar, Partially Hydrogenated Soybean and Cottonseed Oil and/or Palm Oil and Canola Oil, Water, Corn Syrup, Mono and Diglycerides, Food Starch-Modified (Corn), Salt, Potassium Sorbate (Preservative), Titanium Dioxide Color, Polysorbate 60, Artificial Flavor, Citric Acid (Preservative), Red 40, Sodium Benzoate (Preservative). Kids Be sure to wash your hands. Baking can be messy work. You might want to wear a smock or apron. Adults Wash silicone flowerpots with warm soapy water and dry thoroughly. Adults Preheat conventional oven to 350˚F. Grease silicone flowerpots with butter or nonstick cooking spray. Place on baking sheet 2 inches apart. Kids Combine cupcake mix, butter, water and egg* in medium bowl. Using an electric mixer, beat just until combined. Kids Distribute batter into flowerpots just up to the fill line and arrange on cookie sheet 2 inches apart. Use your own pan and liners to make additional cupcakes with any leftover batter. Adults Bake for 14 to 16 minutes or until toothpick inserted into center comes out clean. Remove from the oven and cool completely. KIDS Using an electric mixer, beat room temperature butter on HIGH until light and fluffy. Add powdered sugar and frosting mix and beat on LOW just until combined. Add milk and beat on HIGH until creamy. Spread frosting onto cupcakes. Decorate with included sprinkles and icing pen. 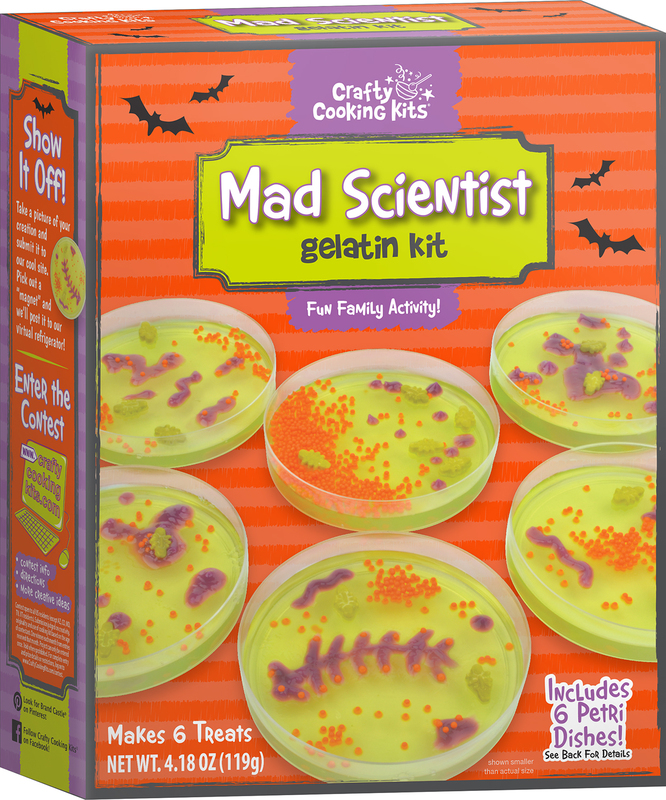 These treats are designed to be enjoyed right from the silicone pots! *High Altitude (over 3500 ft.): Add 3 TBSP. flour to mix, bake 325˚F for 14 to17 minutes. Makes 9 cupcakes. HINT: To reuse your flowerpots with another cupcake recipe, reduce the recipe’s baking temperature by 25 degrees. We recommend hand washing your silicone pots. *Do not use knives or other sharp utensils on silicone cups. *Do not use abrasive sponges or harsh cleaners. 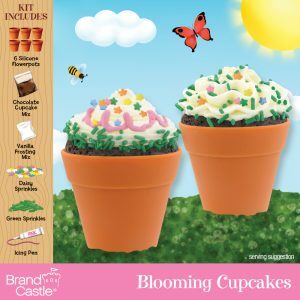 Silicone flowerpots are also great for baking brownies and serving sweet treats such as crispy rice treats, candy, trail mix and ice cream!